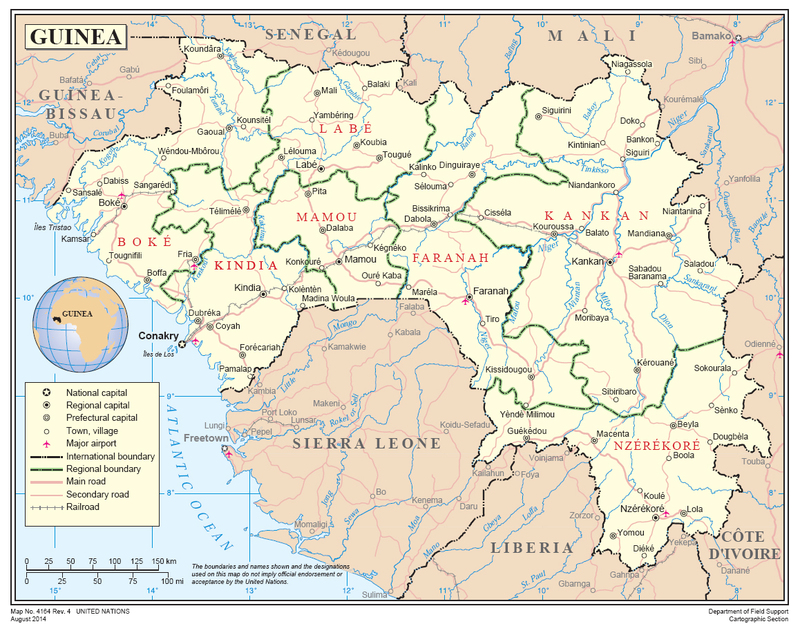 Guinea is the epicentre of the Ebola Virus Disease outbreak in West Africa. The first cases were detected in March 2014 in the Guinea Forest region in the south east of the country. Guinea is one of the poorest countries in the world, ranking 179/187 countries in the United Nations Development Programme (UNDP) Human Development Index. Preceding the Ebola Virus Disease (EVD) outbreak, the country had a low functioning healthcare system, poverty was endemic and malnutrition high, and the road infrastructure made many communities outside of the capital inaccessible. A national health emergency was declared on 13 August 2014. As of 6 May 2015, there have been a total of 3,589 cases (confirmed, probable and suspected) and 2,386 deaths reported. In Guinea, contact tracing remains vital in understanding the chains of transmission and rapidly isolating contacts who become symptomatic. As at 28 June, an average of 56 new contacts were registered per confirmed case, with 2,104 contacts under follow-up. Some 99 per cent of those contacts are being traced daily. Of the newly confirmed cases reported, 70 per cent arose from registered contacts between 1 and 28 June 2015. Current treatment capacity far exceeds need. Accordingly, the World Health Organization (WHO), in coordination with ministries of health and partners, has continued to pursue the safe decommissioning of surplus Ebola treatment centres. Eight core centres will be retained in Guinea strategically located to ensure complete geographic coverage, with additional rapid-response capacity held in reserve. As facilities are decommissioned, district health facilities are being supported to safely assume responsibility for triage and isolation or referral of cases. 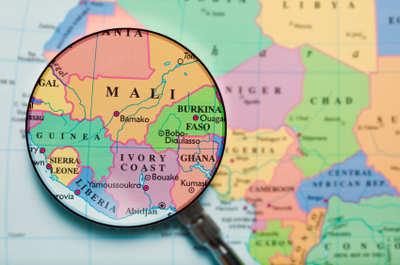 Decommissioning planning has begun in Guinea: 3 of the initial 6 centres remain functional and a new isolation and transit centre has been built in Kamsar, Boké prefecture. There is sufficient laboratory capacity - in June, the number of operational laboratories, coordinated by WHO, increased from 9 to 10 in Guinea. Unsafe burial practices remain of concern although there is sufficient capacity to conduct safe burials at the national level. In June, the WHO country office in Guinea received 56 reports of unsafe burials. The response of the UN system has focused on activities to achieve zero transmission, including reinforcing active surveillance, contact tracing and community engagement and mobilization. In Guinea, efforts are also under way to assist the Government in restoring basic services and preparing for the transition to early recovery. 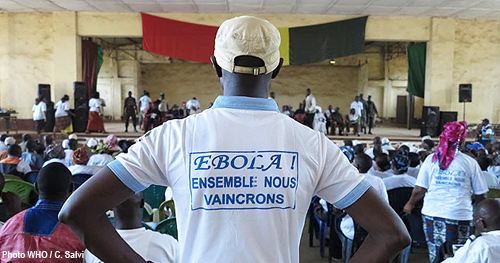 Following the increase in new cases in June, Médecins Sans Frontières set up a fourth Ebola management centre in Boké to support the Ministry of Health of Guinea. Its outreach and social mobilization teams continued to carry out activities, with a particular focus on Conakry and Forécariah. The International Federation of Red Cross and Red Crescent Societies continued to work with national Red Cross societies as the lead partner in safe and dignified burials. In June, teams from the Guinean Red Cross and the International Federation carried out 2,080 such burials. On 6 June, the Guinean Red Cross set up a mobile radio station in Dubréka and distributed solar radio sets for people to listen to Ebola messages. On 7 June, it took over swabbing in Dubréka, making it the sole organization responsible for swabbing in all Ebola-active regions. UNICEF is supporting government efforts to standardize school-based water, sanitation and hygiene infrastructure. In Guinea, more than 2 million people have benefited from household water, sanitation and hygiene kits; 35 boreholes have been rehabilitated in Boké and Kindia and an additional 15 community boreholes have been drilled in Forécariah to benefit in excess of 5,000 people. In partnership with the non-governmental organization (NGO), Search for Common Ground, UNICEF used a mobile cinema to promote proper hygiene through 57 screenings of a special film. WHO recruited in Guinea 207 national workers to support continuing vaccine trials. The Organization will sustain a large presence beyond the end of the outbreak to ensure sufficient surveillance capacity and to support the countries in the implementation of early recovery plans. It has continued to coordinate and deploy international technical assistance from the Global Outbreak Alert and Response Network for nationally led response efforts. In June, the World Food Programme (WFP) extended its emergency operation until September, retaining the capacity to care and contain as transmission continues in the affected countries. In the first two weeks of June, its food supplies reached more than 17,000 quarantined people in Dubréka. In Guinea, WFP completed the construction of the Nongo Ebola treatment unit, which was handed over to Médecins Sans Frontières and opened on 5 July. In preparation for the rainy season, it consolidates all logistics and storage facilities in Guinea and established new helicopter routes in view of the possibility of deteriorating road conditions during the rainy season. The WFP-led logistics cluster supported various campaigns by facilitating the establishment of base camps for humanitarian workers in Guinea; through the emergency telecommunications cluster, Internet services continued to be provided to humanitarian facilities, ensuring reliable Internet access for humanitarian responders. Under the joint collaboration between the Food and Agriculture Organization (FAO) and the World Bank, 48,000 bars of soap and 12,000 bottles of chlorine were distributed to Ebola-affected communities in Guinea and agricultural implements were provided to Guinean farmers. To mitigate the risk of exposure to Ebola through wildlife, in particular as a result of handling and processing bushmeat, a human-wildlife ecosystem interface early warning system is being established. The International Organization for Migration (IOM) continued to support 25 prefectural emergency operations centres with monthly office supplies, fuel for electricity generators and computers with Internet connections. 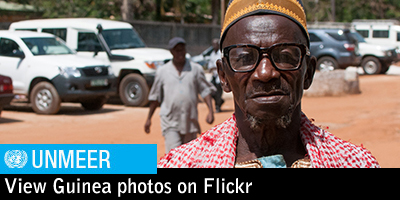 It has rehabilitated buildings housing the Ebola operations centre in Boké. In addition, to ensure safe migration and better health management, IOM is carrying out humanitarian health and border management activities at both the Guinea-Mali border and the Coyah-Forécariah-Pamalap-Kambia border crossings with Sierra Leone. To maintain effective checkpoint operations, it is providing tents, hygiene kits and other equipment at the borders. The United Nations Population Fund (UNFPA) has partnered with UNMEER to support contact tracing in Guinea through a mobile phone-based data collection application. In preparation for the recovery and resilience phases, UNFPA is collaborating with Columbia University and the Ministry of Health to monitor community maternal health indicators through the application. 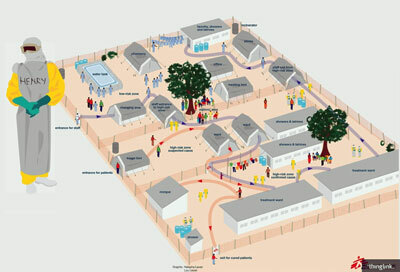 The Office for the Coordination of Humanitarian Affairs (OCHA) continued to monitor humanitarian needs in Guinea, providing operational and technical support to emergency preparedness and contingency planning mechanisms and assisting with preparations by NGOs for the International Ebola Recovery Conference held on 10 July. UNMEER has funded 13 community-based projects from the Trust Fund, for a total of $934,759. 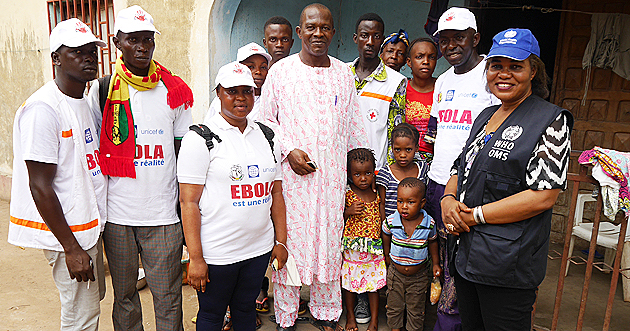 The projects supported social mobilization and communication activities and assisted Ebola-affected populations through the provision of nutrition support, sanitation and condolence kits and cash incentives for Ebola response workers. With its closure, the Mission has transferred the management of the community-based project mechanism of the Trust Fund to UNDP in the country, including an unspent $1 million for new projects. As part of its drawdown process, UNMEER provided logistical support to the Ebola national coordination and response partners in Guinea by donating 79 vehicles previously on loan to them. UNMEER has made arrangements to hand over to WHO 1,000 disinfectant dispensers, 3,330 litres of disinfectant liquid, a blood cell counter and an incubator. The United Nations Development Programme (UNDP) worked closely with the Government of Guinea and with the secretariat of the Mano River Union to support them in costing and finalizing their recovery plans ahead of the International Ebola Recovery Conference. With support from the UN Special Envoy, David Nabarro, UNDP worked to identify resource gaps, engage in advocacy with donors for new pledges of funding against the plans and support the organization of the Conference. WHO is working to strengthen national awareness of and build capacity in infection prevention and control and patient safety practices. In Guinea, WHO is training 400 pharmacists to ensure that personal protective equipment and standard precautions for Ebola arrive at the front line regularly. It is also working with the Government to develop infection prevention and control and patient safety pre-service curricula for health-care workers. The Organization is also assisting in the strengthening of national response capacity in planning, implementation, data collection and monitoring with regard to mental health and psychosocial support by supporting a two-day technical consultation on the impact of Ebola on mental health. In Guinea, the United Nations Population Fund (UNFPA) continues to build a resilient health system through the Mano River Midwifery Response initiative, with funding from UNMEER and the Government of Japan. In collaboration with the Ministry of Health, and to increase the provision of sexual and reproductive health services in communities, 50 midwives were recruited and deployed in 25 border health-care facilities. UNICEF and implementing partners have monitored in the country how well Ebola safety protocols are being followed in schools in the regions of Faranah, Kankan, Kindia and Mamou. Overall, visits to schools show that teachers and pupils are adhering to the protocols. Twenty-one radio stations continue to broadcast education programmes, including key messages about Ebola prevention. The rural radio station in Forécariah continues to broadcast morning Ebola awareness-raising and evening education programmes. Concerns remain over the prevalence of unknown chains of transmission in Guinea. Communities are and will continue to be the driving force of the response as efforts to identify and uproot the triggers of transmission in the remaining affected localities continue. With a view to strengthening response efforts on the ground and addressing remaining hotspots, a campaign of reinforced surveillance was implemented in the country. Read how Marie Claire and her 60-member team helped support the outbreak response in Guinea through social mobilization. Where in Africa is Guinea? What does an Ebola Treatment Unit look like?